If the left-sided fullback receives a pass from the goalkeeper, then the RW presses the ball and prevent the full back from attacking the gate. The No.9 the bends their run to prevent or intercept a pass to the left-sided centre back. The No.9 then will follow the left-sided centre backs movement. The LW will at the same time pushes on to the right-sided centre back and follows his run. To consider the distance between the 3 attackers and to maintain the co-ordinated movement of the unit. (For example the adjustment of position in relation to ball and to remain narrow when defending). To deny space, delay progress and to try and win the ball as early and as high up the pitch as possible. (Forcing errors from the defender). To force the play towards the centre and in front of their own goal, whilst still working as a unit (Forcing opponents to play backwards or in front of their own goal). Attempt to intercept passes (Read and anticipate likely passes). 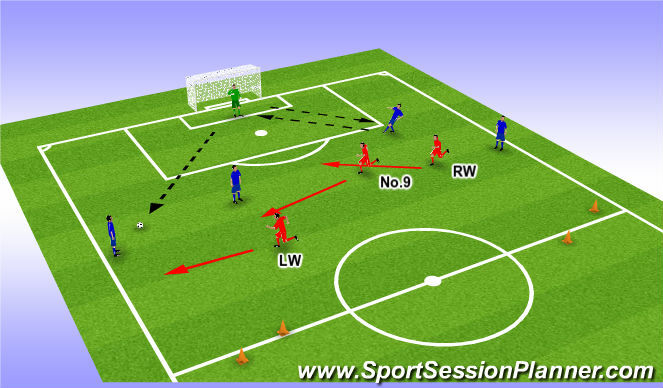 If the left-sided centre back receives a pass from the goalkeeper, then the No.9 presses the ball and prevent the centre back from moving forward with the ball. The RW bends their run to prevent or intercept a pass to the left-sided full back back. The RW then will follow the left-sided full backs movement. The LW will at the same time bend their run towards the right-sided centre back and follows his movement. If the left-sided full back or centre back decides to recycle the ball back to the goalkeeper and the goalkeeper switches the play, then the RW will look to delay and prevent the right-sided full back from moving forward by holding their position in front of the gate. The No.9 and LW will makes a recovery run to support the RW. When the No.9 and LW are in a supportive position then the RW will press the right-sided full back and the No.9 will bend their run to prevent / intercept the pass to the right-side centre back and follow their movements. At the same time the LW will pressure the left-sided centre back and follow their run.